Apple has added three more countries to the list of markets where carrier billing is enabled, with users in Denmark, Hong Kong, and Sweden now able to pay for Apple Music, iTunes, and other Apple services through their phone bill for a number of carriers instead of using a credit or debit card. According to a recent update to Apple's support documents, carrier billing is offered to customers of five carriers in the new markets. Regional versions of the carrier Three support carrier billing in all three areas, accompanied by SmarTone in Hong Kong and by Telenor Sverige AB in Sweden, but Three is the only carrier providing the payment facility in Denmark. The addition of Denmark, Hong Kong, and Sweden bring the total list of countries supporting carrier billing up to 17, across 29 mobile phone networks. The list of countries does include some major first-world nations, including France, Germany, Italy, and Japan, but the United States, Canada, and the United Kingdom are notably still absent from the list, among others. Carrier billing effectively allows users to pay for goods and services by adding the cost to their mobile phone bill, rather than using a debit card, a credit card, or cash for the transaction. In the case of Apple, customers can pay for their Apple Music subscription through their phone bill, as well as purchases from iTunes, iBooks, and the App Store. 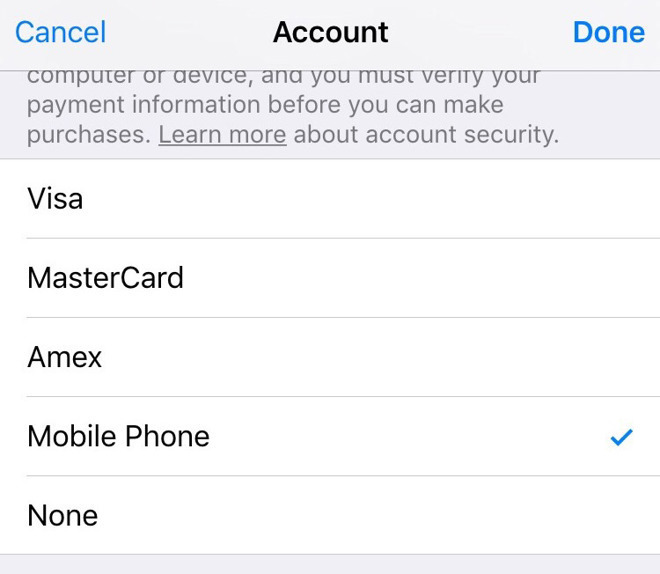 To set up the facility, users on mobile networks supporting carrier billing can select "Mobile Phone" as the payment method within the Payment Information section of their iPhone, iPad, or iPod touch's Account Settings menu. Verifying the associated mobile phone number can be performed by tapping "Use This Mobile Number: on an iPhone, or by using an SMS-based single-use code on a separate device by tapping "Use a Different Mobile Number." It is also possible to set up carrier billing within iTunes on a Mac or Windows PC, by signing in with an Apple ID and clicking "View My Account" within the Account menu. An "Edit" link in the Apple ID Summary will allow users to select a different payment type, using the one-time SMS code method with a smartphone.